Home / hair care / product recommendations / "When I die. . . I want a wind machine so that even in the casket my hair is blowing just like Beyoncé’s." "When I die. . . I want a wind machine so that even in the casket my hair is blowing just like Beyoncé’s." I had planned to do an outfit shoot for today as an ode to the end of summer, but it's been about a million degrees here over the last week. Tomorrow's high? 32 degrees Celsius (about 90 degrees Fahrenheit), with a humidex of over 40 (104 degrees Fahrenheit). Disgusting. Needless to say, I've been wearing my hair in haphazard buns, little makeup, and shorts and t-shirts in an otherwise failed attempt at staying cool. Over the weekend, the temps are supposed to significantly drop, and as I'll be back in class (#ugh), I'll be dressing more like myself again. Until then, I thought I'd share my favourite hair products. I've been addicted to watching Youtube videos these past few weeks. While I'm not nearly techy enough to do a video (clearly you can tell by my horrible editing and blog layout that I'm an amateur), I figured photos would work just as well. 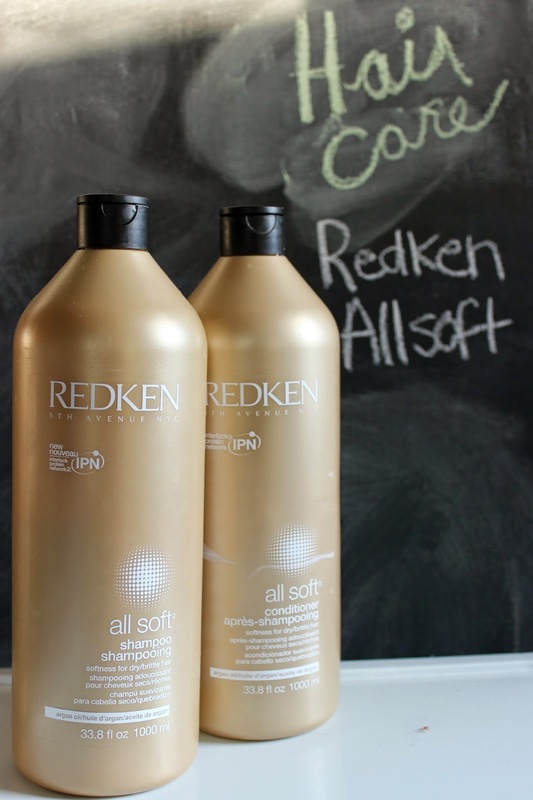 Everyday: I have been washing my hair with the Redken All Soft shampoo and conditioner for years. I stopped for a while, and switched to a John Frieda volumizing shampoo, but it just wasn't the same. While this set isn't necessarily the cheapest, it leaves my hair feeling so soft and glossy looking. And for the size of the bottles, you can't complain. 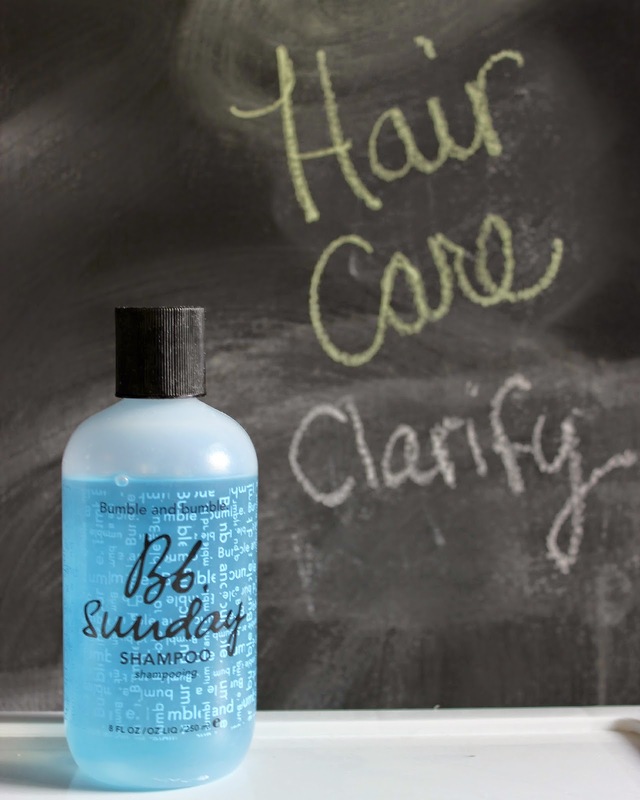 Once a Week: Every Sunday (or Saturday, depending on my plans), I wash my hair with the Bumble and Bumble Sunday clarifying shampoo instead. This is amazing at getting rid of the product buildup from the week, and leaves my hair looking really full and feeling lightweight. Again, this little bottle isn't cheap, but it lasts for a really long time, and is certainly better than any other clarifier I've tried (and after a horrible dye job earlier this year, I can say I'm almost an expert on clarifiers). Day Two Hair: I know it's not good to wash your hair everyday, and let's face it, who has the time anyway? My hair is getting long again, so the whole washing, blow drying, straightening spiel is definitely time consuming. 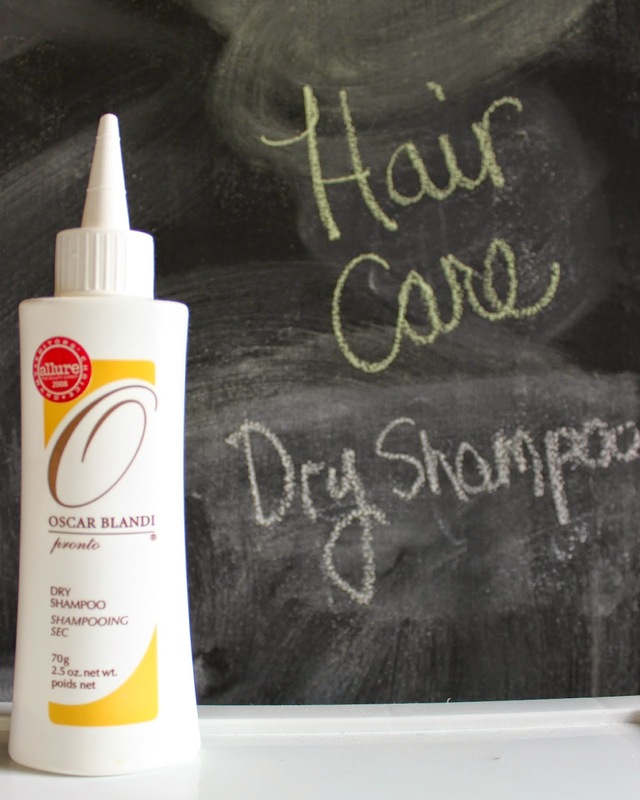 My verdict on the Oscar Blandi Pronto Dry Shampoo? Iffy. It does a great job at absorbing the oil on day two (and my hair can get quite oily), but it also leaves a powdery white residue that flakes off during the day. Funny story time: I was in an exam this year, and needed clarification on a question. While I was waiting for my prof to come over, I realized that I had little while flakes all over the shoulders of my black sweater. I was quickly wiping them off when I realized my prof was standing right in front of me. I quickly blurted out that I don't have dandruff, and that it was only dry shampoo, but he looked less than impressed. Damage Control: About 2-3 times a week, I switch my all soft conditioner for this L'oreal Total Repair hair mask. It's about $9.00 here (and I just grabbed it on sale at Shoppers Drug Mart for $3.99), so it's a total steal. It smells amazing, works like a charm, and leaves my hair feeling super soft. Another bonus? It also helps tame the frizz and when I let my hair naturally dry after using it, the curls are much more manageable and elongated. 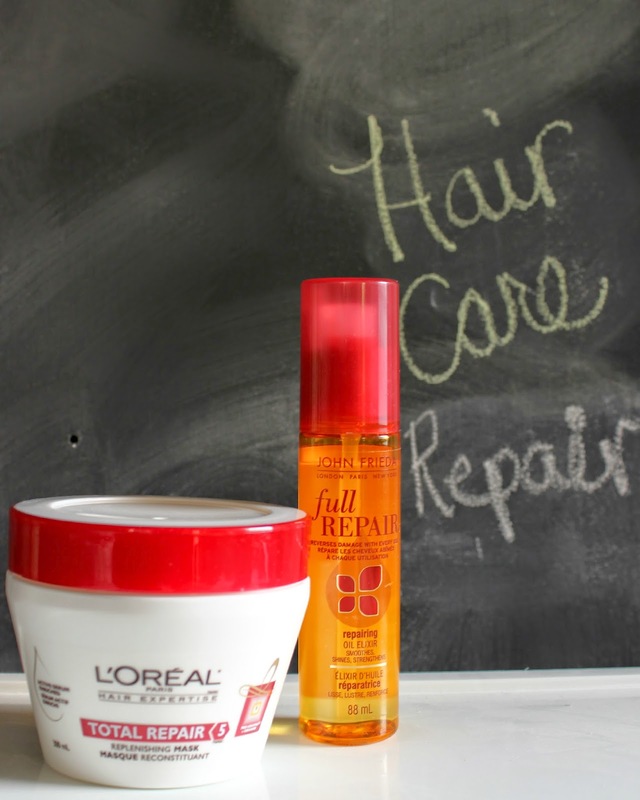 The John Frieda Full Repair is something I use once to twice a day. I purchased it after seeing it in a magazine and fell in love. You can use it in damp or dry hair. Pro tip: when it says only use one pump, it means only use one freaking pump. The first time I used it, I thought, "well that doesn't look like much, I'll add a few more pumps". By the time my hair dried, it looked greasier than before I washed it. However, when you are putting it in dry hair, you can add a pump more pumps as dry hair isn't as absorbent (but be careful to only concentrate on the middle to bottom of your hair). I've been using this for about two months, and as you can see, it looks like I've barely touched it. A little goes a long way. Final Steps: I was looking for more eco-friendly hair care products (things that were not laden with chemicals), and I came across the Alterna Bamboo Smooth line. Oh my freaking gosh. The smell is amazing. The kind of amazing where I can just sit there and smell my own hair and think, "Damn, I smell good". The only thing with this product is that you have to apply it to damp hair, seeing as it is a cream and not a spray. But it's amazing in the fact that it not only protects your hair from heat damage, but also works to repair past damage. 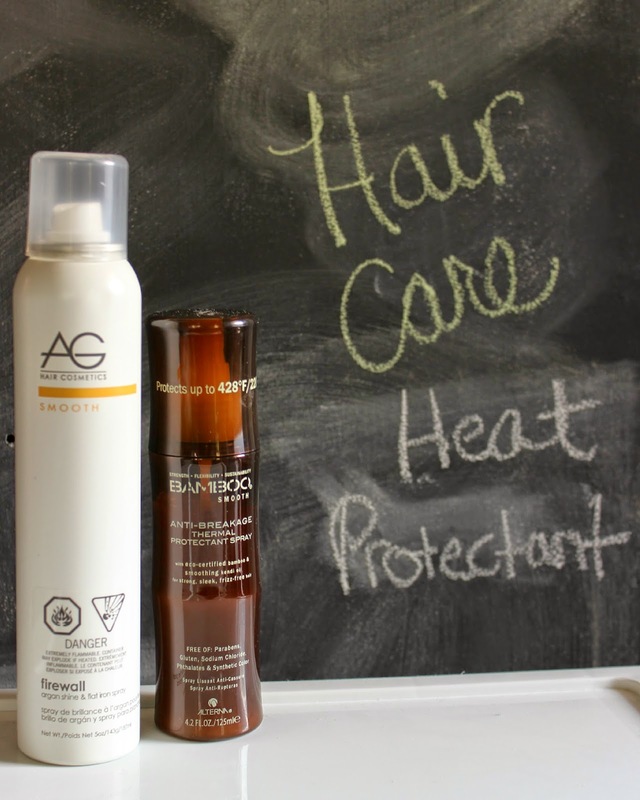 For the days where I let my hair air dry, I spray the AG Smooth Firewall protectant in just before I straighten and/or curl my hair. Pro tip: be careful where you spray this stuff. It leaves my hardwood floor so freaking slippery, and I've slipped on multiple occasions. At first, I couldn't figure out what was wrong with my floor, and then it dawned on me. I like to spray this with my back to the shower, so any residue that misses my head will be washed away anyway. But this product is really light-weight, unlike a lot of other hair products that seem very dense and weigh your hair down. And it is only lightly scented, so it won't compete with any other body or hair scents you may be using. So what did you think? Do you use any of these products? Would you like to see more product recommendations?